Carte D'Irlande Projelle de assujettie aux Observation Astronomiques. 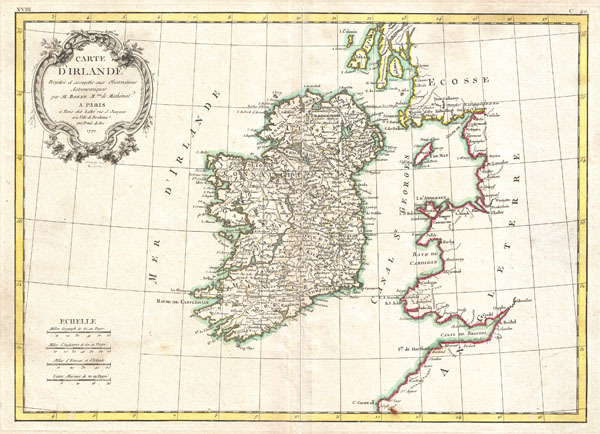 A beautiful example of Rigobert Bonne's 1771 decorative map of Ireland. Includes all of Ireland as well as parts of neighboring England and Scotland. An elaborate decorative title cartouche appears in the upper left quadrant. Drawn by R. Bonne 1771 for issue as plate no. C 20 in Jean Lattre's 1776 issue of the Atlas Moderne. Rumsey 2612.042. Phillips (Atlases) 664. National Maritime Museum, 215.